Francesca Rossi is the daughter of the biggest mobster boss in Chicago. Her entire life has been planned. No work, no college. Just marriage to her childhood best friend, Angelo Bandini and then she needs to pop out children. That is the way it has always been in the Chicago outfit. However things don't go as plan when Senator Wolfe Keaton spots Francesca and decides that she will be the perfect revenge for him. Wolfe steals the kiss that Francesca intends on sharing with Angelo before going to Francesca's house and stealing her. Wolfe has hated Francesca's father for ruining his life and his family. Taking her away from her sheltered life and ruining all the plans her father has intended for her is the best way for Wolfe to avenge his family. I saw this book recommended on Audible and was not really interested. So I do not know how I ended up purchasing a copy after seeing it on Goodreads. However I started this book and could not put it down (so much so that I now have an ebook copy AND an audiobook). This was an interesting read with a unique plot and beautifully crafted characters. I absolutely detested Wolfe however it was difficult to not feel sympathy for him and root for his relationship with Francesca throughout this novel. If you are a fan of romance books, definitely give this a try. You will not regret it. 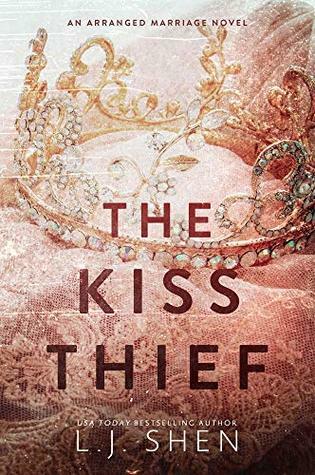 Sign into Goodreads to see if any of your friends have read The Kiss Thief.